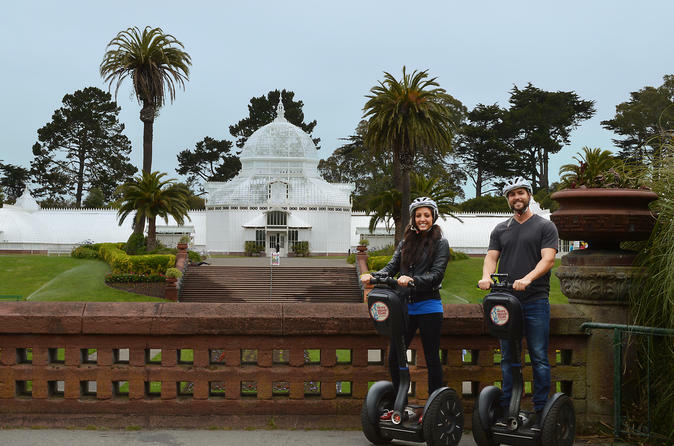 Combine the fun of touring San Francisco by Segway with the personal touch of having a private guide attentive to your group’s interests and skills. This itinerary features Golden Gate Park and great views of the Golden Gate Bridge and Alcatraz. You’ll be able to cover more ground than walking and enjoy the fun of the Segway personal transporter for a once-in-a-lifetime experience while touring San Francisco! Riding a Segway is intuitive, like bike-riding, but it takes a moment to learn how to operate it. You'll have 35-45 minutes of Segway training before beginning your tour, so that you become comfortable riding the most innovative transportation of the millennium. You will practice until your group feels familiar with the Segway, then be ready to tour San Francisco! Explore and learn about hidden parts of Golden Gate Park. 3 hour experience that includes extra riding time. The seven mile (11.2 km) tour route explores the eastern section of the 1017 acre (411 ha) park on winding trails and bike routes.